Lincoln City boss Danny Cowley feels if Sean Dyche was Sean Dichio, he would get more praise for the job he is doing at Turf Moor. 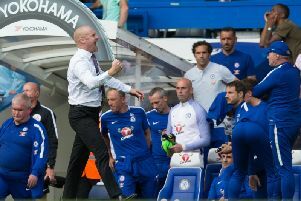 And while Dyche appreciates the compliment, he isn’t overly concerned about how he or his side are perceived – only about trying to win the next game. Lincoln are 81 places below the Clarets in the football pyramid, but the National League leaders will be granted the respect they deserve. Dyche said: “I thank Danny for his words, and he’s doing a great job at Lincoln. “But I’m not too worried about how I’m perceived. “Winning is winning, no matter how it’s viewed. “And while it’s not winning as much as we were in the Championship, it’s winning against the odds in the Premier League I suppose. Dyche has done his due diligence on tomorrow’s opponents, who have sent Oldham Athletic, Ipswich Town and Brighton packing from the cup already. He was at Sincil Bank for the 3-2 win over Woking on Saturday, and knows his side will have to be bang at it to avoid an upset: “One thing we pride ourselves on is treating every game the same, and we will be taking it properly serious as you’d expect. “We prepare properly for every game – it’s not just words, we’re not sending out a message, we will be right mentally and physically, and try to deliver tactically. The reward for the victor tomorrow is a place in the last eight – a stage Burnley haven’t reached since 2003, when Dyche was a substitute in the Watford side which beat the Clarets 2-0 at Vicarage Road. Dyche also reached the semi-finals, famously, with Chesterfield, and while the priority is staying in the Premier League, he said: “We would all like to go as far as we can in the cup, obviously it can be perceived to be more glamourous than the league by some, but the league is different – it is a long season and how you measure real success, being able to deliver that consistency. He is also missing cup-tied record signing Robbie Brady, while Jeff Hendrick sits out the second of a three-match ban for his dismissal at Watford.